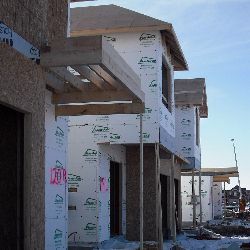 In this new sub-division the builder is using 1 3/8" thick (R-5.5) rigid board insulation on the exterior walls and R-12 fiberglass insulation between the 2x4 studs for a total of R-17.5 insulation value for the exterior walls. The rigid board insulation is covered by building paper which serves more as a moisture barrier than as a vapour barrier. As shown to the right (lower picture) this home will have an exterior stone finish. Rigid foam board insulation is made from glass fiber or foam plastic materials. These materials have a high insulating R-value per inch but is more expensive than loose-fill or batt/blanket insulation. Insulating boards are lightweight and easy to cut and handle. Fitting them into irregular spaces, however, can be a challenge. This type of insulation is commonly used in residential applications and is available in a variety of sizes and thicknesses. The most common applications are: below-grade (exterior foundation walls), above-grade (exterior walls) and interior foundation walls (basement walls). The most common and least expensive type used is the white coloured expanded polystyrene (EPS). The R-value is approximately R-4 per inch (25 mm). It is commonly sold in panels of 4'x8' and 2'x8'. It must be protected from prolonged exposure to sunlight and requires covering with a fire-resistant material. Most of the coloured types of insulation you will find in a home renovation store are made of extruded polystyrene (XPS). They are more expensive but have an higher R-value. Again, the most common type of insulation for below-grade applications is the extruded polythyrene (XPS). The insulation is only applied to the section of wall that will be below-grade (from footings to finished grade). A compatible bead of sealant is applied to the top of each board to prevent water/moisture from getting behind the insulation. The boards are fastened to the foundation wall with concrete fasteners and washers. 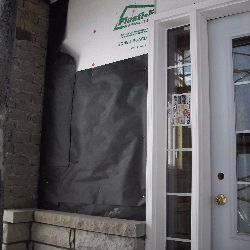 If the insulation is extended above grade and up to the top of the foundation wall the above-grade section has to be parged to protect the insulation from sunlight. The top of the insulation should be capped with J-channel, metal flashing or wood flashing to prevent water damage. Click here to view cap illustrations. Both EPS and XPS are petroleum-based products. For more information on these products talk to your supplier.